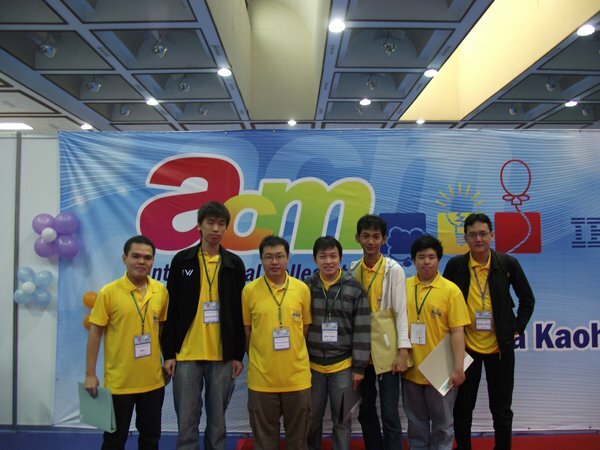 Every year, the ACM (Association for Computing Machinery) held ICPC (International Collegiate Programming Contest). ICPC is a world-level computer programming competition. Each campus which wants to follow ICPC, is required to attend the regional level preliminary round. The winners of regional competitions will become the ICPC finalists. Binus have attended this event since 1996 and first entered the world finals in 1997. At the regional level competition in 2011, Binus participate in the 2 competition site, Malaysia and Taiwan. At Malaysia, BINUS programming team got 23th and 26th rank, and at the Taiwan, BINUS programming team got 15th and 20th rank. The results of the evaluation of the implementation of ACM ICPC Asia Regional Contest hosting at Jakarta last year is, we got a good appreciation from the participant teams and Asia Regional Director. Every year, the ACM (Association for Computing Machinery) held ICPC (International Collegiate Programming Contest). ICPC is a world-level computer programming competition. Each campus which wants to follow ICPC, is required to attend the regional level preliminary round. The winners of regional competitions will become the ICPC finalists. Binus have attended this event since 1996 and first entered the world finals in 1997. Since 2008, Binus University is trusted to be the host of ACM-ICPC Asia Regional Contest, and this goes up to 3 years in a row. In 2011, because of Regional Director of Asia decided to rolling the event with Malaysia and the Philippines, in this year Binus University does not hold a Regional Contest, but instead, Binus University ACM-ICPC held Indonesia National Contest. However these events remain within the scope of the ACM-ICPC. BNSC is an expertise competition on the ASEAN level, which refers to the world level of expertise (world skills competitions). Both competitions are conducted two years alternately, the ASC in every even year, and WSC in every odd year. Every year, Binus University held a Programming Contest for High School Students (BNPC-HS). BNPC-HS is a national computer programming contest for high school students. The competition aims to get new seeds to be nurtured to become part of the Binus programming team after joining and becoming students at Binus University. Mathematics and Statistics, or commonly abbreviated MATIC Competition, is a competition of Mathematics and Statistics organized by the School of Computer Science of Binus University every year. Participants of MATIC consist of high school students, from X, XI, and XII grade. The purpose of this MATIC itself is introducing the field of Mathematics and Statistics science for high school students as a branch of science that has many applications in daily life and in the industries such as Information Technology (Information Technology). In addition, the organizers are hoping that this event can develop the existing potential of young people nationwide further. And of course bring the science of Mathematics and Statistics to become an increasingly popular field of science by the public, concerning so many applications that can be applied based on the Mathematics and Statistics. Since 2011, Mathematics & Statistics Department, with the new outlook in the School of Computer Science of BINUS University, Mathematics Student Association (HIMMAT) and Statistics Student Association (HIMSTAT) held MATIC to the range of the national territory of Indonesia.